Is the X-37B space plane a potential replacement for NASA’s retired Space Shuttle programme? 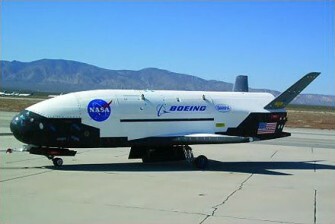 The X-37B is essentially a quarter-scale version of the Space Shuttle flown by NASA between 1981 and 2011. Launched atop an Atlas V rocket, the 29-foot-long X-37B is used to carry small payloads into orbit and return them to Earth up to 270 days later, landing like an airplane. The Air Force claims the X-37B is strictly for experimental purposes, though the flying branch has been vague on details. The craft’s versatility means it could probably be used for many other tasks. ‘You can put sensors in there, satellites in there,’ says Eric Sterner, from The Marshall Institute in Virginia. Boeing has built two X-37Bs. The first flew its inaugural mission between April and December last year. The second X-37B launched in March. The space plane’s nominal mission endurance is nine months, but the Air Force ‘will try to extend it as circumstances allow,’ said Lt. Col. Tom McIntyre. Meanwhile, Grantz revealed Boeing’s plans for an X-37C model, which would be nearly twice as long as the B version, with sufficient capacity for up to six astronauts. The X-37C could be controlled robotically – or by a human pilot. ‘Once qualified for human flight, these vehicles could transport a mix of astronauts and cargo to the [International Space Station] and offer a much gentler return to a runway landing for the space tourism industry,’ Grantz wrote in a report. With the Space Shuttles headed for museums, the United States doesn’t currently possess a vehicle capable of carrying astronauts. For crew swaps aboard the International Space Station, Washington rents Russian Soyuz capsules. NASA is developing a new passenger capsule and a new, large rocket for manned missions; a number of private companies are also experimenting with manned spacecraft. If Boeing proceeds past the study phase, the X-37C could compete with these systems. Space planes capable of landing on runways remain very much in vogue, four decades after the Space Shuttle’s development. Russia and China for their part have both reportedly experimented with small space planes similar to the X-37B.